Summary: The narrator gets a lesson in patience when he wakes up to a rainy day. He is ready to go outside, but hi grandfather insists it’s better to wait until the rain stop. While Granddad writes letters, his grandson dreams of floating cities and sea monsters. Finally, the rain has stopped, and Granddad is ready to mail his letters. On the walk to the mailbox, the two imagine adventures that continue even when the rain picks up again. At home with warm socks and hot chocolate, the two agree that the best things are worth waiting for. 40 pages; ages 3-7. 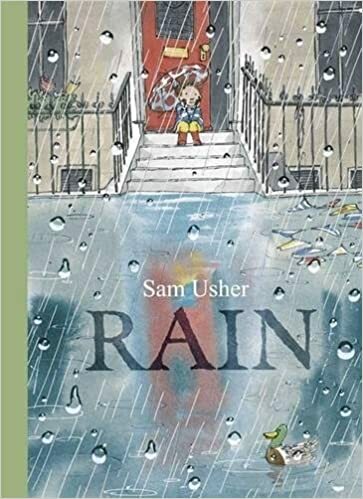 Pros: This follow-up to Sam Usher’s Snow celebrates rainy days, intergenerational relationships, and the power of imagination. The watercolors are the perfect medium to capture the colors and reflections of a rainy day. Cons: Written letters and a mailbox? What child will recognize those antiquities?